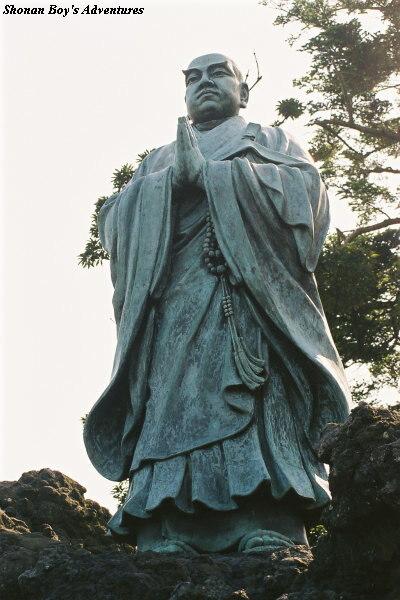 When Nichiren Daishonin was 32 years old (on 28 April, 1253), he chanted Daimoku and decided to establish his Buddhism in Asahigamori of Seichoji seeing the rising sun. He also severely criticized the widespread Nembutsu (or Pure Land) doctrine as one that drives people into the hell of incessant suffering. Tojo, Kagenobu, the steward of the area and an ardent Nembutsu believer, became furious on hearing this. He ordered his wariors to seize Nichiren. After Nichiren Daishonin's preaching, Tojo attempted to kill Nichiren Daishonin in the mountain. In 29th April, Nichiren Daishonin visited his parents in Kominato. 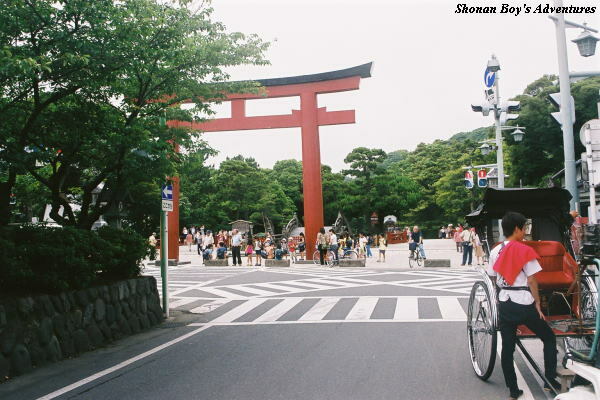 On the same day, Nichiren Daishonin left for Kamakura in the center of government, and he arrived in Kamakura in May. Then he established the Hut in Matsuba-ga-yatsu, Nagoe, Kamakura. Excluding the Izu Exile for 3 years, Nichiren Daishonin had stayed here for about 15 years for missionary work, and many people became his pupils. Also Matsubayagatsu has been called "Nagoe Matsubagayatsu". 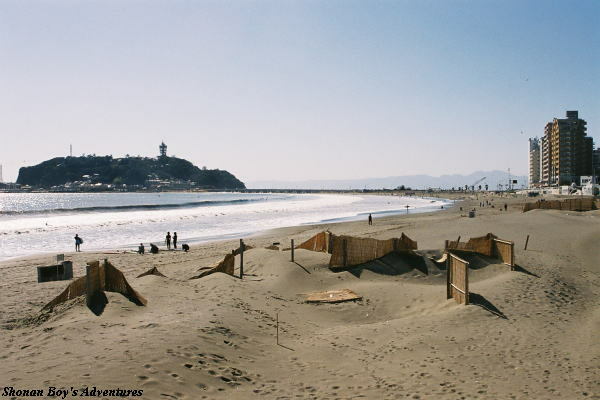 In Matsubagayatsu located in the southeast of Kamakura city (near the boundary line between Kamakura city and Zushi city), there are 3 temples called "the site of the Hut" at present. They are "Myoho temple, Ankokuron temple and Chosho temple". 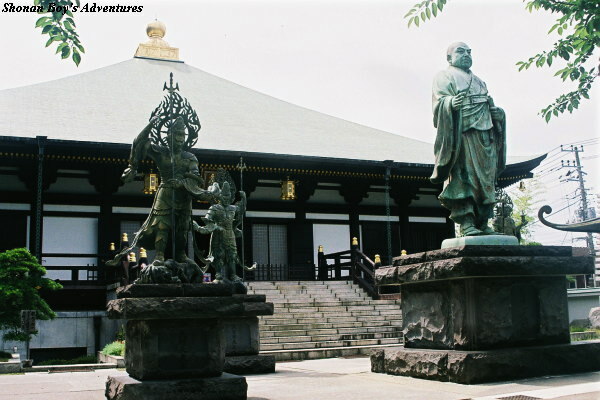 Kamakura government was established in 1192. In those days, there have been unusual disturbances in the heavens, strange occurrences on earth, famine and pestilence, all affecting every corner of the empire and spreading throughout the land. Oxen and horses lie dead in the streets, and the bones of the stricken crowd the highways. Over half the population has already been carried off by death. The people of those days all turn their backs upon what is right; to a person, they give their allegiance to evil. This is the reason that the benevolent deities have abandoned the nation and departed together, that sages left and did not return. And in their stead devils and demons came, and disasters and calamities occured. This is the persecution what Nichiren Daishonin was attacked by Nembutsu believers in the Hut of Matsubayatatsu on 27th August, 1260. Nichiren Daishonin had appealed to Kamakura Government; the reason why the famines and plagues had started going around all over Japan since 1256, was that priests of Shingon, Nembutsu, Zen and Ritsu school had slandered the Lotus Sutra. On 16th July, 1260, Nichiren Daishonin tendered the "Rissho Ankoku Ron (On Establishing the Correct Teaching for the Peace of the Land) through Yadoya Saemon, what he recommend Hojo Tokiyori discard mistaken religion and believe the Lotus Sutra. But the Kamakura Government officials of power got angry, and priests of Nembutsu and other religions had grudge against Daishonin. On 27th August, Nembutsu believers behind Hojo Shigetoki and the government officials of power attacked the Hut in Matsubagayatsu in the midnight. Nichiren Daishonin escaped this persecution, and went out of Kamakura, and then went to Toki Jonin's residence in the province of Shimousa (present Chiba prefecture) at one time. In one year, he established the Hut in Matsubagayatsu, Kamakura, again. Since then, Kamakura Government had persecuted Nichiren Daishonin, such as they exile him to Izu peninsula (Izu Exile) for innocence, etc. The Buddha made a prophecy, saying: "After my death, during the beginning of the Latter Day of the Law that follows the two millennia of the Former and Middle Days, a person will appear who will propagate only the heart of the Lotus Sutra, the five characters of the daimoku. At that time an evil ruler will be in power, and evil monks, more numerous than the dust particles of the land, will argue with one another over the various Mahayana and Hinayama sutras. When the votary of the daimoku challenges the monks, they will incite their lay supporters to abuse, beat or imprison him, to confiscate his lands, to exile or behead him. In spite of such persecutions, he will continue his propagation without ceasing. Meanwhile the ruler who persecutes him willbe beset by rebellion, and his subjects will devour each other like hungry spirits. Finally the land will be attacked by a foreign country, for Brahma, Shakra, the gods of the sun and moon, and the four heavenly kings have ordained that other countries shall assault a land that is hostile to the Lotus Sutra." Certainly these predictions came true. Chosho-ji the Yokosuka line train, running through the town of Nagoe Matsubagayatsu. This is a temple in Matsubagayatsu. There are a few story of this temple, and we omitted to tell about history of this temple. Though this temple insists that there was a Hut of Nichiren Daishonin, this statement is not certain at present. It takes 1 minute from "Chosho-ji" bus stop on foot. 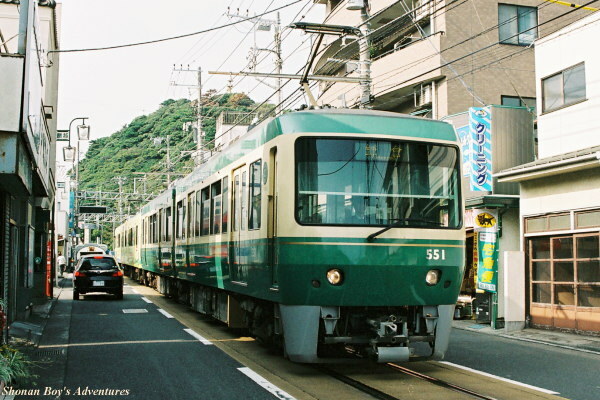 As buses operate only twice per hour, it may be earlier to walk from Kamakura staion. And it takes about 5 minutes to walk from Ankokuron-ji and Myoho-ji. Please check the business time and holidays before you visit. 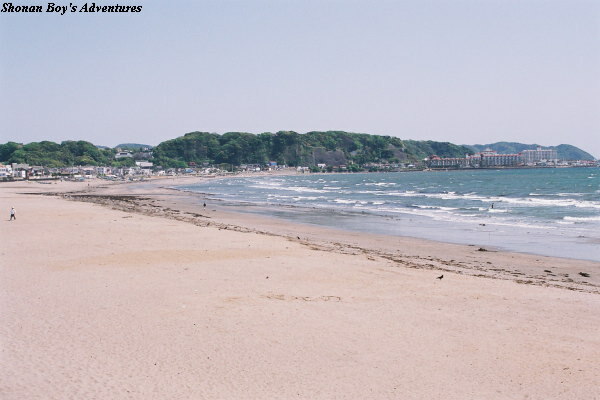 From "Kamakura" station of JR Yokosuka Line & Enoden, 25 minutes walk. From "Kamakura" station of JR Yokosuka Line & Enoden, take the Keihin Kyuko Bus (Keikyu bus) bound for "Shin-zushi station via Nagoe" (operated twice per hour). 6 minutes to "Chosho-ji" bus stop (except traffic jam), then 1 minute on foot. 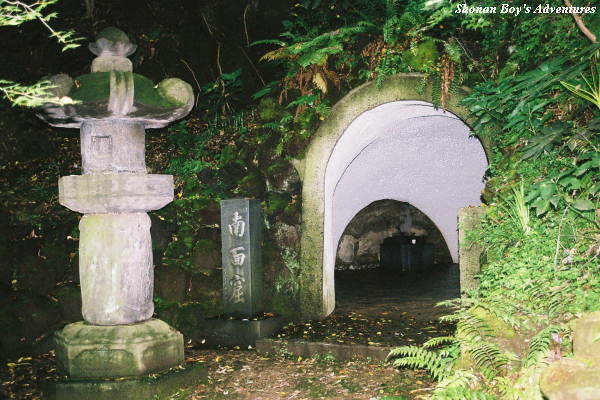 Ankokuron-ji There is a cave "Nammen Cave (south facing cave)" where Nichiren Daishonin sheltered temporarily, when the Hut of Matsubagayatsu was attacked (Matsubagayatsu Persecution). 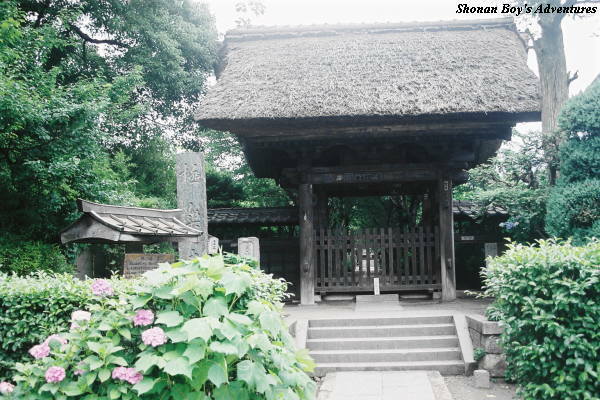 This temple is also the one of story of "the site of the Hut of Matsubayatsu". It takes 3 minute from "Nagoe" bus stop on foot. As buses operate only twice per hour, it may be earlier to walk from Kamakura staion. And it takes about 5 minutes to walk from Chosho-ji, and does 1 minute from Myoho-ji. Please check the business time and holidays before you visit. From "Kamakura" station of JR Yokosuka Line & Enoden, 20 minutes walk. From "Kamakura" station of JR Yokosuka Line & Enoden, take the Keihin Kyuko Bus (Keikyu Bus) bound for "Shin-zushi station via Nagoe" (operated twice per hour). 4 minutes to "Nagoe" bus stop (except traffic jam), then 3 minutes on foot. Myoho-ji In 1357, this temple was established. 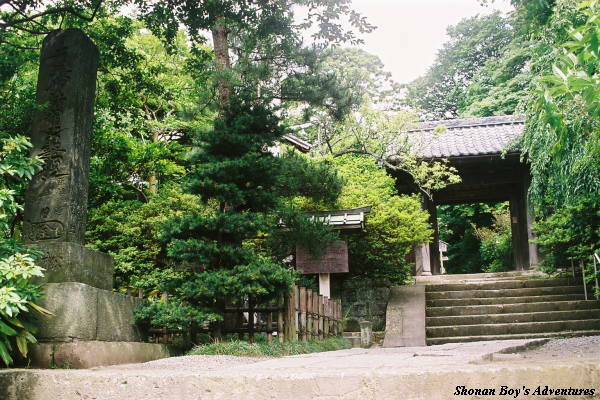 It is well-known about moss plant on the stone stairs, and called "moss plant temple". There is a place where we think one building is the site of Hut. Other than Myoho-ji, people say Ankokuron-ji is also the site of the Hut. It takes 3 minute from "Nagoe" bus stop on foot. 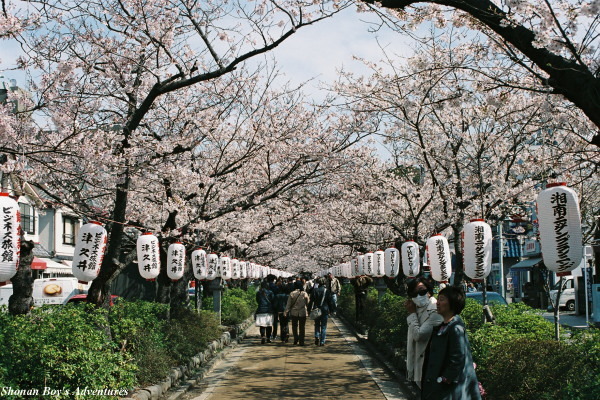 As buses operate only twice per hour, it may be earlier to walk from Kamakura staion. And it takes about 5 minutes to walk from Chosho-ji, and does 1 minute from Ankokuron-ji Please check the business time and holidays before you visit. From "Kamakura" station of JR Yokosuka Line & Enoden, take the Keihin Kyuko Bus (Keikyu Bus) bound for "Shin-zushi station via Nagoe" (operated twice per hour). 4 minutes to "Nagoe" bus stop (except traffic jam), then 4 minutes on foot. On the sightseeing map, "Nichiren Shonin Tsujiseppo Ato" in Japanese Nichiren Daishonin preached his Buddhism, and criticized the many kinds of Buddhism other than the Lotus Sutra here. There were many Nembutsu believers at that time in Kamakura, and some people threw stones to him. In spite of their insults, he continued to preach his Buddhism. From "Kamakura" station of JR Yokosuka Line & Enoden, 9 minutes walk. 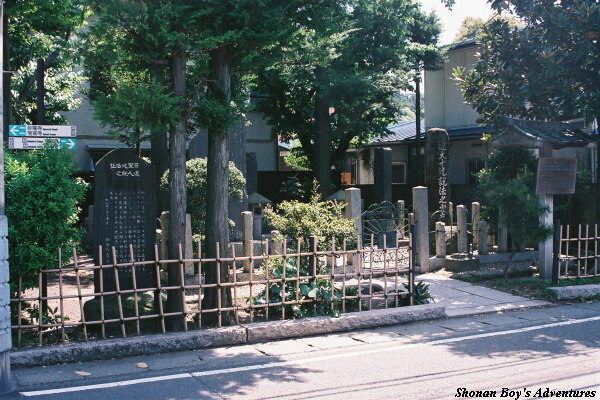 This is the temple of former "Shijo, Kingo's house" It was small temple surrounded by private houses. Please check the business time and holidays before you visit. 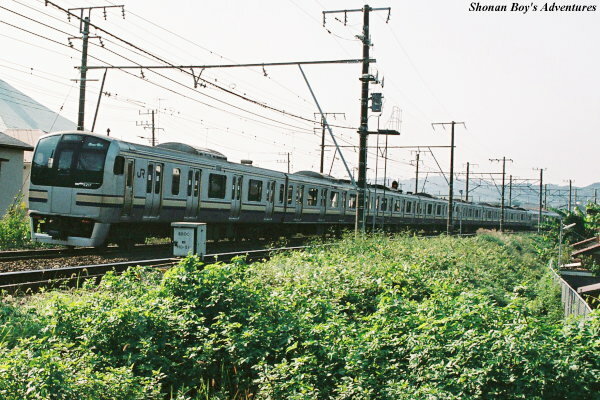 From "Hase" station of Enoden, 2 minutes walk. left side near the entrance of Ryuko-ji At present, there is no place name called "Tatsunokuchi". 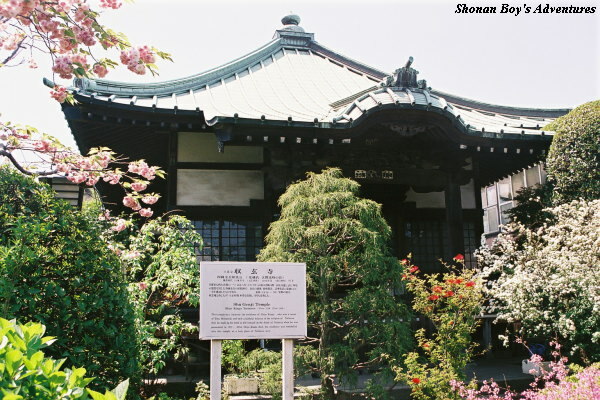 This is the temple of Nichiren-shu Minobu school, and it was established in 1337 at the site of Tatsunokuchi Execution. There is a five-storied pagoda. In the midnight of 12 September, 1271, Nichiren was tried to be beheaded by Hei-no-Saemonnojo Yoritsuna at the Tatsunokuchi execution near Enoshima. Before a man tried to behead Nichiren, round shining object appeared suddenly from the direction of Enoshima, and they were blinded. So Nichiren was not killed. It seems that the story of "round shining object" is the Bull shooting star. The right photo is the monument of "Tatsunokuchi Persecution". 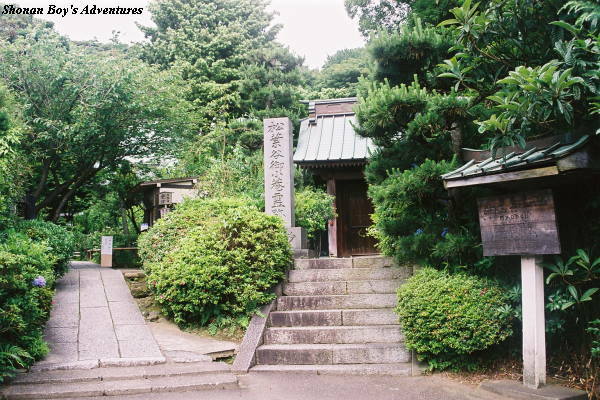 It seems that the place where Nichiren Daishonin was tried to behead was "Higashihama" near Ryuko-ji. From "Enoshima" station of Enoden, 3 minutes walk. 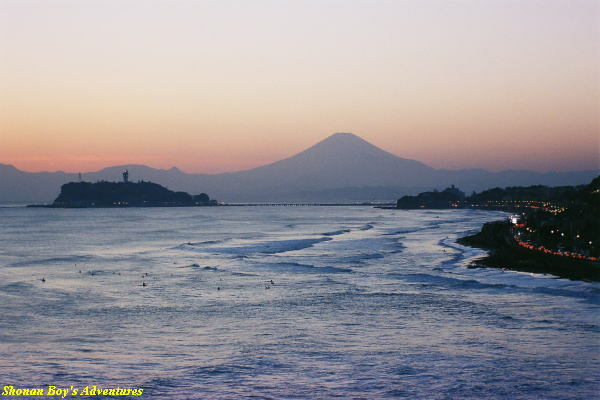 From "Shonan-enoshima" station of Shonan Monorail, 2 minutes walk. From "Katase-enoshima" station of Odakyu Enoshima line, 8 minutes walk. Gokuraku Temple This is the persecution what Nichiren Daishonin's heheading in Tatsunokuchi, Kamakura on 12th September, 1271. The origin of this persecution was that Gokurakuji Ryokan was defeated by Nichiren Daishonin because of praying for rain. And Ryokan conspired with the government officials, and he prepared for persecution against Nichiren Daishonin. Hei no Saemon led several hundreds of armor-clad warriors to take Nichiren Daishonin, and attacked the Hut of Matsubagayatsu. Wearing the headgear of a court noble, Hei no Saemon glared in anger and spoke in a rough voice. Sho-bo, Hei no Saemon's chief retainer, rushed up, snatched the scroll of the fifth volume of the Lotus Sutra from inside Daishonin's robes, and struck him in the face with it three times. Then Sho-bo threw it open on the floor. Warriors seized the nine other scrolls of the sutra, unrolled them, and trampled on them or wound them about their bodies, scattering the scrolls all over the matting and wooden floors until every corner of the house was strewn with them. Nichiren Daishonin said in a loud voice, "How amusing! Look at Hei no Saemon gone mad! You gentlemen have just toppled the pillar of Japan." Hearing this, the assembled troops were taken aback. When they saw Daishonin standing before the fierce arm of the law unafraid, they must have realized that they were in the wrong, for the color drained from their faces. Nichiren Daishonin believed firmly that he read the sentence "believers of the Lotus Sutra would be abused and beaten with sticks and staves in the Encouraging Devotion of the chapter 13th of the Lotus Sutra" by body. He was arrested and sent to Hojo Nobutoki's residence then without investigation. at present That night of the twelfth, Nichiren Daishonin placed under the custody of the lord of the province of Musashi and around midnight was taken out of Kamakura to be executed without investigation. As they set out on Wakamiya Avenue (It seems that it was present Wakamiya-oji. ), Daishonin looked at the crowd of warriors surrounding him and said, "Don't make a fuss. I won't cause any trouble. I merely wish to say my last words to Great Boddhisattva Hachiman." Shrine He got down from his horse and called out in a loud voice, "Great Boddhisattva Hachiman, are you truly a god? When Wake no Kiyomaro was about to be beheaded, you appeared as a moon ten feet wide. When the Great Teacher Dengyo lectured on the Lotus Sutra, you bestowed upon him a purple surplice as an offering. Now I, Nichiren, am the foremost votary of the Lotus Sutra in all of Japan, and am entirely without guilt. I have expounded the doctrine to save all the people of Japan from falling into the great citadel of the hell of incessant suffering for slandering the Lotus Sutra. Moreover, if the forces of the great Mongol empire attack this country, can even the Sun Goddess and Great Bodhisattva Hachiman remain safe and unharmed? When Shakyamuni Buddha expounded the Lotus Sutra, Many Treasures Buddha and the Buddha and bodhisattvas of the ten directions gathered, shining like so many suns and moons, stars and mirrors. In the presence of the countless heavenly gods as well as the benevolent deities and sages of India, China, and Japan, Shakyamuni Buddha urged each one to submit a written pledge to protect the votary of the Lotus Sutra at all times. Each and every one of you gods made this pledge. I should not have to remind you. Why do you not appear at once to fulfill your solemn oath?" Finally Daishonin called out: "If I am executed tonight and go to the pure land of Eagle Peak, I will dare to report to Shakyamuni Buddha, the lord of teachings, that the Sun Goddess and Great Bodhisattva Hachiman are the deities who have broken their oath to him. If you feel this will go hard with you, you had better do something about it right away!" Then Nichiren Daishonin remounted his horse. (Yui-ga-hama) Out on Yui Beach (Yui-ga-hama) as the party passed the shrine there, Nichiren Daishonin spoke again. "Stop a minutes, gentlemen. I have a message for someone living near here," he said. He sent a boy called Kumao to Nakatsukasa Saburo Saemon-no-jo (Shijo, Kingo) , who rushed to meet Daishonin without straw sandals. Nichiren Daishonin told him, "Tonight, I will be beheaded. This is something I have wished for many years. In this saha world, I have been born as a pheasant only to be caught by hawks, born a mouse only to be eaten by cats, and born human only to be killed attempting to defend my wife and children from enemies. Such things have befallen me more times than the dust particles of the land. But until now, I have never given up my life for the sake of the Lotus Sutra. In this life, I was born to become a humble priest, unable to adequately discharge my filial duty to my parents or fully repay the debt of gratitude I owe to my country. Now is the time when I will offer my head to the Lotus Sutra and share the blessings therefrom with my deceased parents, and with my disciples and lay supporters, just as I have promised you." Then the for men, Shijo Kingo and his brothers, holding on to Daishonin's horse's reins, went with Daishonin to Tatsunokuchi at Koshigoe. Finally they came to a place that he know must to be the site of his execution. The soldiers stopped and began to mill around in excitement. Shijo Kingo, in tears, said, "These are your last moments!" Nichiren Daishonin replied, "You don't understand! What greater joy could there be? Don't you remember what you have promised?" Nichiren Daishonin chanted Daimoku, and sat down for execution. persecution Before a man tried to behead Nichiren, round shining object appeared suddenly from the direction of Enoshima. It seems that the story of "round shining object" is the Bull shooting star. The executioner fell on his face, his eyes blinded. The soldiers were filled with panic. Some ran off into the distance, some jumped down from their horses and huddled on the ground, while others crowched in their saddles. Nichiren Daishonin called out, "Here, why do you shrink from this vile prisoner? Come closer! Come closer!" But no one would approach him. "What if the dawn should come? You must hurry up and execute me --- once the day break, it will be too ugly a job." He urged them on, but they made no response. Ex-Tatsunokuchi execution place was on the right of bridge. 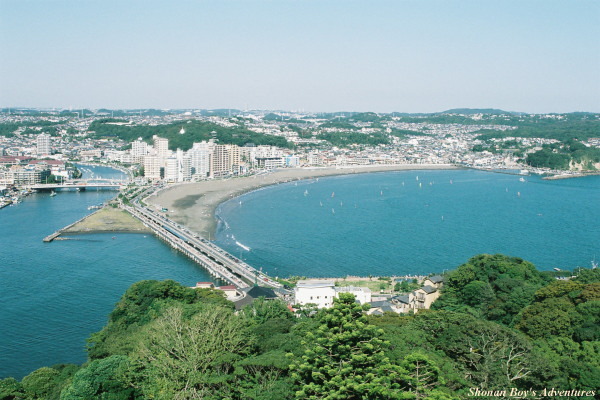 (from Enoshima Observation Tower) They waited a short while, and then Nichiren Daishonin was told to proceed to Echi in the same province of Sagami. He replied, "Since none of us knew the way, someone would have to guide us there." No one was willing to take the lead, but after they had waited for some times, one soldier finally said, "That's the road you should take." Setting off, they followed the road and around noon reached Echi. 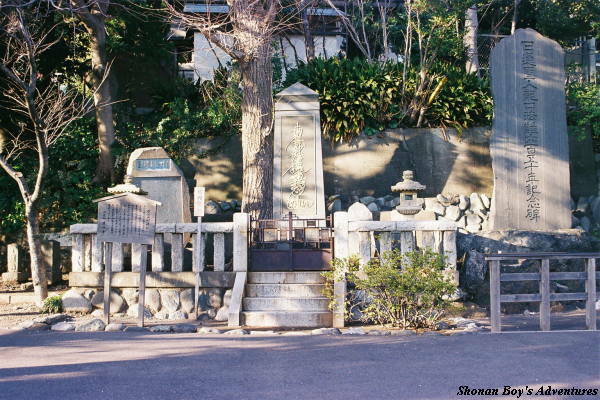 They then proceeded to the residence of Homma Rokuro Saemon. There Daishonin ordered sake (rice wine) for the soldiers. When the time came for them to leave, some bowed their heads, joined their palms, and said in a most respectful manner: "We did not realize what kind of a man you are. We hated you because we had been told that you slandered Amida Buddha, the one we worship. But now that we have seen with our own eyes what has happend to you, we understand how worthy a person you are, and will discard the Nembutsu that we have practiced for so long." Some of them even took their prayer beads out of their tinder bags and flung them away. Others pledged that they would never again chant the Nembutsu. After they left, Rokuro Saemon's retainers took over the guard. Then Shijo Kingo and his brothers took their leave. Nichiren Daishonin was kept at Echi for more than twenty days. 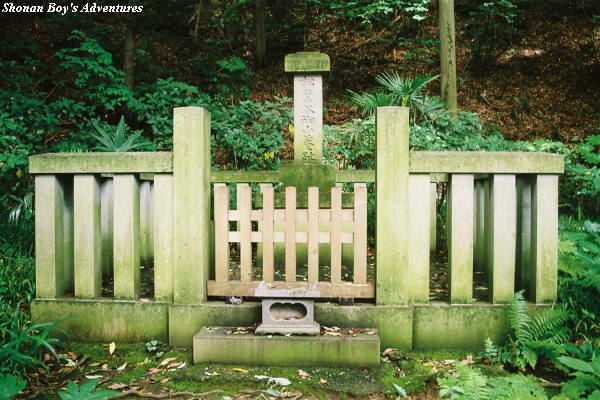 During that period seven or eight cases of arson and an endless succession of murders took place in Kamakura. Slanderers went around saying that Nichiren's disciples were setting the fires. The government officials thought this might be true and made up a list of over 260 of his followers who they believed should be expelled from Kamakura. Word spread that these persons were all to be exiled to remote islands, and that those disciples already in prisons would be beheaded. It turned out, however, that the fires were set by the observers of the precepts and the Nembutsu believers in an attempt to implicate his disciples. Really it was "The three obstacles and four devils emerge in confusing form, vying with one another to interfere. (English Gosho P.770)" Nichiren Daishonin say "Nichiren, my best allies in attaining Buddhahood are Kagenobu (Tojo, Kagenobu) , the priest Ryokan, Doryu, and Doamidabutsu, and Hei no Semon and the lord of Sagami. I am grateful when I think that without them I could not have proved myself to be the votary of the Lotus Sutra." Therefore Nichiren Daishonin was determined to sent to Sado (Sado Exile). He departed from Echi on 10th October, 1271, and arrived in the province of Sado on 28th October. During his exile in Sado-ga-shima, he wrote many writings. After pardon of his exile, the Government showed the sign of respecting Nichiren Daishonin at one time, however, they did not stop to belong to the religions that slandering the Lotus Sutra what Nichiren Daishonin said. Nichiren Daishonin had been determined all along that, if after three attempts to warn the rulers of the nation his advice still went unheeded, he would leave the country. With that thought in mind, he accordingly left Kamakura and arrived on Mount Minobu. Japan had been attacked by Mongolia twice (the calamity of foreign invasion), and Hojo clan rebelled within the ruling clan. (the calamity of internal strife). All the things what Nichiren Daishonin said came true, and Kamakura government was ruined. Please understand that we could not display addresses and phone numbers of these Kaikan. 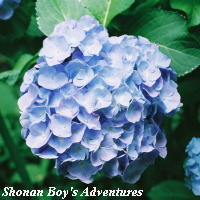 Copyright (c) 2002 - 2010 Shonan Boy's Adventures. All right Reserved.